Theological seminaries [духовні семінарії; dukhovni seminarii] Educational institutions for spiritual formation and instruction on religious doctrine and rite, largely or exclusively for future members of the clergy. Seminaries were first established in Ukraine in the 18th century. Before that, prospective clergymen obtained their theological education in a variety of formal and informal settings, mostly through schools affiliated with a church or monastery run by clerics. From Kyivan Rus’ times to about the 17th century, religious instruction was the major part of any general education. Candidates for the priesthood usually supplemented their formal studies with a period of apprenticeship to a senior priest. Religious training could also be acquired through private studies or study abroad; following such a study a person who could demonstrate to a bishop or his designate that he was literate and qualified could be admitted to the priesthood. The growth of new educational institutions in Ukraine in the 16th and 17th centuries, such as the brotherhood schools, the Ostrih Academy, the Zamostia Academy, and the Kyivan Mohyla Academy, increased the options available to prospective clerics for gaining a general education and rudimentary theological training. The first seminaries in Ukraine were established on the basis of Orthodox colleges and cathedral theology schools. Chernihiv College, established in 1700, was reorganized as a theological seminary in 1776. Pereiaslav College, established in 1738, soon became a seminary. Sometimes referred to as the ‘Little Russian seminary,’ it was active until 1862. A theological seminary existed in Novhorod-Siverskyi from 1785 until 1797, when it was transferred to Poltava. It closed down in 1819 and was not reopened until 1862. Kharkiv College was initially (1722–34) an eparchial seminary before growing into a more general college; it reverted to its original role in 1817. Other seminaries were created in the late 18th and early 19th centuries in Zhytomyr, Sharhorod (1797, moved to Kamianets-Podilskyi in 1806), and Kyiv (1817). Through the 19th and early 20th centuries a full system of Orthodox theological seminaries under the control of the Russian Holy Synod was established in Ukraine as part of a general overhaul of theological training in the Russian Empire. Each eparchy set up a seminary to train candidates for the priesthood. The course of studies consisted of four years of general studies followed by two years of theological studies, with the language of instruction being Russian. If a seminarian wished to continue his studies, he could enter a theological academy; other options were available after 1896, when the universities of Warsaw, Dorpat (Tartu), and Tomsk were opened to seminarians. Theological academies (eg, the Kyiv Theological Academy) also trained professors for the seminaries. The eparchial seminaries were also charged with overseeing lower-ranking theological schools at the county level which prepared candidates for seminaries. 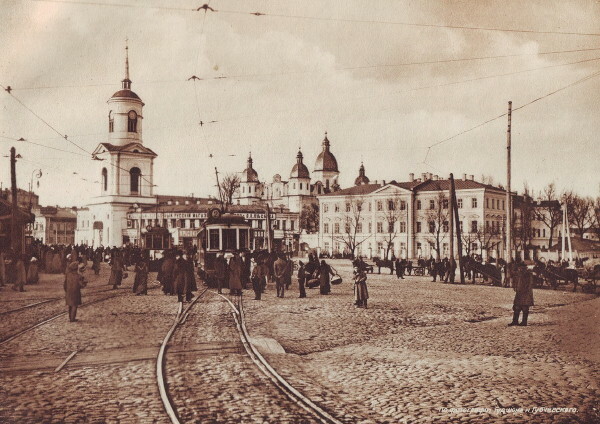 By 1911 the seminary system was fully in place, and institutions could be found in Kyiv, Kamianets-Podilskyi, Zhytomyr, Kharkiv, Odesa, Katerynoslav, Simferopol, Yelysavethrad, Poltava, Chernihiv, and Kholm. In the early 1920s the Soviet regime liquidated the theological seminaries. Only after the Second World War were seminaries reopened in Ukraine, in Kyiv, Odesa, and Lutsk. In the interwar period some Ukrainian priests were trained at the seminary of the Polish Autocephalous Orthodox church in Kremianets. There was a department of Orthodox theology, with such prominent Ukrainians as Oleksander Lototsky and Vasyl Bidnov on the staff, at the University of Warsaw. In Bukovyna limited training was provided for Ukrainian priests at the residence of the metropolitan of Bukovyna in Chernivtsi. In Canada, Ukrainian Orthodox theological training has been centered at Saint Andrew's College in Winnipeg; in the United States the Saint Sophia Seminary was established at South Bound Brook, New Jersey, in 1975. A systematic approach to theological education for Catholic Ukrainians was not developed until the late 18th century. A good number of prospective clergymen were schooled in Catholic cathedral schools or Jesuit-run colleges with a Latin rite orientation. In the 18th century a network of approximately 50 schools modeled on Jesuit counterparts and run largely by Basilian monks was established in Right-Bank Ukraine. The majority of their pupils were Polish or Polonized gentry, although the schools provided a basic education for future Uniate clerics as well. Some efforts were made to establish Uniate theological seminaries during the 17th century, but these institutions, such as those found in Zhytomyr, Radomyshl, and Kamianets-Podilskyi, were usually short-lived. A number of private seminaries also sought to meet the demand for qualified Uniate clergymen. Nevertheless, the majority of Uniate clergymen ultimately received their education in Roman Catholic institutions. Many of them, particularly future hierarchs, even studied outside of Poland, at schools in Rome, Vienna, Prague, or elsewhere. Following the incorporation of Galicia into Austria, demands were made by both secular and ecclesiastical authorities for an improvement in the qualifications of the Uniate clergy. Subsequently a Greek Catholic seminary called the Barbareum was formed in Vienna, in 1774. It was succeeded by the Greek Catholic Theological Seminary in Lviv in 1783, which provided theological training for future clergymen until 1944. The program was supplemented by courses, some of them taught in Ukrainian, offered by the theology department of Lviv University. During the interwar period difficulties emerged in maintaining the Ukrainian presence in the theology department because of hindrance from Polish authorities. A theology faculty was thereupon added to the seminary, and in 1928 it was expanded into the separate Greek Catholic Theological Academy. A higher education in theological studies could also be obtained by prospective Uniate clergymen at Lviv University or at a number of other Catholic religious study centers, particularly in Rome, Vienna, Innsbruck, Budapest, and Warsaw. For a period after the establishment of the Lviv seminary, the Studium Ruthenum (1787–1809) offered a remedial means of providing upper-level theological training for Ukrainian seminarians not fluent in Latin. Other eparchies in Western Ukraine also established Ukrainian Catholic theological seminaries. A seminary existed in Peremyshl in 1780–3. In 1845 it was revived, but offered only a fourth and final year of study. It became a full seminary in 1912 (see Peremyshl Greek Catholic Theological Seminary). Stanyslaviv eparchy opened its own seminary in 1907. Two seminaries were established in Transcarpathia, one in Uzhhorod (1778) and the other in Prešov (1880). As well, a Jesuit-supported Catholic seminary was opened in Dubno, Volhynia, in 1931 in order to shore up the Neounion church movement. All these institutions were liquidated by the Soviet authorities, starting in 1939, with the first occupation of Western Ukraine, and continuing after 1945, with the annexation of the region into the Ukrainian SSR. With the renewed religious tolerance in the last years of the USSR seminaries were opened in 1990 in Lviv, Uzhhorod, and Ivano-Frankivsk. Ukrainian Catholic seminaries have also been established outside of Ukrainian territories. Križevci eparchy operates a small seminary in Zagreb. In the United States Saint Josaphat Seminary was founded by the Philadelphia exarchate in 1942; it was moved to Washington, DC in 1950. A second seminary (Cyril and Methodius) for Transcarpathian Ukrainians (Carpatho-Ruthenians) was established in 1951 in a suburb of Pittsburgh. A seminary was founded in Hirschberg, Bavaria, in 1946 and moved in 1949 to Culemborg, Holland where it functioned until 1951. The Holy Spirit Intereparchial Seminary was opened in Ottawa in 1981. The oldest Ukrainian Catholic seminary in the West remains Saint Josaphat's Ukrainian Pontifical College in Rome, which was established in 1897. Its program of theological studies was augmented and completed by the formation of Saint Clement Ukrainian Catholic University in Rome in 1963. Candidates for the priesthood commonly receive part of their training in other institutions, such as theological institutes, the theology faculties of universities, or colleges. Particularly significant are the minor seminaries established by the Ukrainian Catholic church in Galicia during the interwar era and in the West. Basilian monasteries also have trained many people for the priesthood in their novitiates. A referral to this page is found in 21 entries.